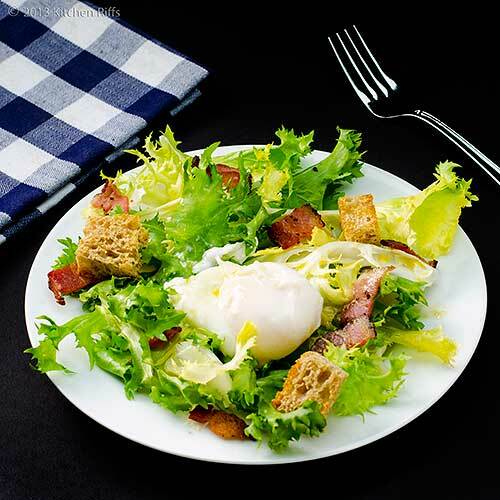 Salade Frisée aux Lardons is made with curly endive, garnished with crisp bacon or salt pork, and topped (usually) with a poached egg. Though originally a country-style dish, it has long been a bistro specialty throughout much of France. It’s not hard to see why. This is a simple dish filled with hearty flavors. Depending on portion size, it can work equally well as a starter or a main course. During the cold-weather months, I like this as a first course, followed by a stew or soup. During the spring and summer, when my taste turns to lighter fare, a largish serving of this salad makes a great dinner — especially if accompanied by some nice bread and a glass of wine. If you’re already familiar with Salade Frisée aux Lardons, I don’t need to sell you on how great it is. But if this recipe is new to you, be forewarned: This may become your new favorite salad. You can serve this salad with either hot or cold dressing. 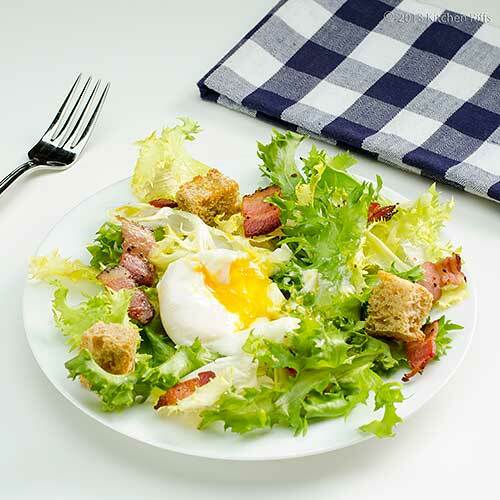 For the cold version, you make an ordinary vinaigrette and toss it with the curly endive, then garnish the salad with bacon pieces, a poached egg, and croutons. For the hot version, you add the dressing ingredients to hot bacon fat and heat briefly, then add to the greens and toss (wilting them somewhat) before adding the croutons and poached egg. The hot version uses a procedure that is virtually identical to the one discussed in our post on Spinach Salad with Hot Bacon Dressing. In today’s post, we make the salad with cold dressing, but I’ll discuss the hot version in the Notes. “Lardons” are strips or cubes of pork fat. If you can find unsliced bacon, that’s ideal — simply cut it into strips about ¼-inch wide and an inch long. Otherwise, just use regular bacon, preferably thick sliced. Every supermarket stocks curly endive (frisée). The outer leaves tend to be dark green, while the inner leaves are more yellow. The inner leaves are more tender, so when buying frisée, make sure it has plenty of (yellowish) inner leaves. This recipe takes about 15 minutes of active time to make, although you’ll want to wash, dry, and chill the curly endive for at least an hour before you begin. This recipe serves 2 as a main course. The same recipe can serve 4 as a first-course salad, but in that case you’ll need to add a couple more poached eggs to the ingredient list. If you want a less hearty salad, skip the egg. I recently posted about How to Poach Eggs. As the post explains, you can poach eggs ahead of time, then warm them in hot water right before serving. Because this method is so simple, I’m going to assume that’s what you’ll be doing. In the Notes, though, I’ll discuss alternative timing in case you want to poach the eggs as you make the salad. At least an hour before you want to serve the salad, tear the curly endive into small pieces. Wash and dry, then chill in the refrigerator. When you want to prepare the salad, start by half-filling a small saucepan or skillet with water, and placing it on the stove to heat (this is for warming the poached eggs). You want to bring the water just to a simmer. Cut bacon into ½-inch pieces, place in a cold frying pan, and heat on medium on the stovetop. Cook until nicely crisp, then remove from heat. Remove bacon pieces with a slotted spoon and drain on paper towels. Peel the garlic clove and mince finely. Place in a small bowl or jar that has a cover. Add the mustard, red wine vinegar, and extra virgin olive oil. Cover the bowl and shake to emulsify the salad dressing. Taste, add salt and pepper to taste, and set aside. When the water is at a simmer and the bacon is crisp, place the salad greens in a large bowl and add about half the vinaigrette dressing. Toss, and add more vinaigrette if necessary (I generally use most of it, but not always). Plate the salad greens. Slide the cold, previously poached eggs into the simmering water to warm for 1 minute (set the timer so you don’t forget them). 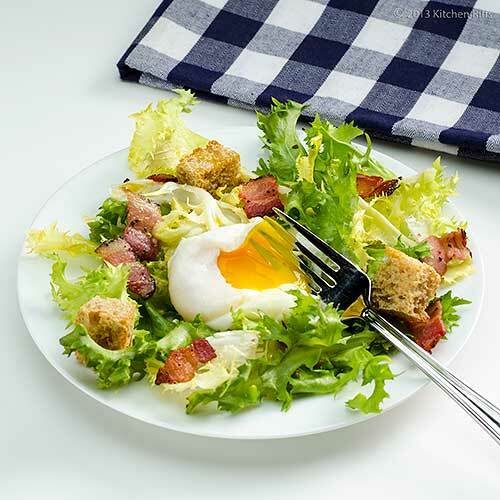 While the eggs are warming, sprinkle the bacon and croutons on the salad greens. When the poached eggs have warmed for 1 minute, remove them with a slotted spoon, drain briefly on a paper towel (or kitchen towel) and top each salad with an egg. Serve. I like the bite of garlic in this dish, but if you want something more subtle, substitute shallot — say 2 teaspoons, minced finely. If you want to serve a hot dressing with this salad, here’s how: Mix up the vinaigrette as usual. Cook the bacon as directed in Step 3, but don’t remove from the pan — just set it aside. When you’re ready to serve the salad, reheat the pan with the bacon and add the vinaigrette. Heat until it begins to simmer, then scrape the vinaigrette and bacon pieces into the salad greens (Step 5) and toss. Some people also like to add the croutons to the bacon pan when they’re heating the dressing. Alternatively, you could just add the mustard, vinegar, oil, and garlic to the hot bacon fat and whisk to form an emulsion as the ingredients heat. Make sure you taste to adjust seasoning (but be careful — the fat will be hot). Adding mustard to the vinaigrette helps form an emulsion, in addition to providing great flavor. In fact, it’s the mustard that allows you to make the dressing by shaking it up — oil and vinegar wouldn’t combine well otherwise. If you prefer, you can make the dressing the traditional way: Whisk the mustard and vinegar together, then whisk in the oil drop by drop. If you don’t want to poach the eggs ahead of time, just do it as you’re mixing the salad. Start the water in Step 2, then add the eggs to the barely simmering water 4 minutes before you’re ready to plate the salad (that’s how long they take to poach). Remove the poached eggs with a slotted spoon, drain for a few seconds on a towel, then add to the salad plates. Some people like to daub a bit of olive oil or salad dressing on the poached egg after they plate it, to give it a bit of a shine. Others like to add a few snips of chives or another herb for additional garnish. Not necessary, IMO, but you may disagree. I’ve seen main-course versions of this salad that use sausage in addition to the bacon and egg (maybe a quarter pound per person). If you go that route, I’d recommend using a flavorful smoked sausage like kielbasa — just sauté it until it’s warmed through and then add to the salad. “What’s on tap?” Mrs K R inquired as she broke into her poached egg. “You mean we should dive into endive?” I asked. Good thing I didn’t lard on any bacon jokes — that would have really egged her on. I make a very similar one. I replace bacon with beans and add a bit of honey to a dressing. Yummy. Hi John, your salad sure look appetizing and refreshing. Nice click. Thanks for sharing all the wonderful notes. Voilà: a wonderful French Bistro salad! The combination of flavors and textures with crispy bacon and crunchy endive sounds like a match made in heaven, perfect for spring time. Hi Marta, I like the substitution of beans and addition of honey - sounds terrific! Thanks for the comment. Hi Amelia, it's a wonderful salad, and truly worth trying. Thanks for the kind words, and comment. Hi Daniela, isn't it great? ;-) And really one of my favorite spring meals - for me, it's an entire light dinner. Thanks for the comment. Ok John, this will be our dinner tonight. You are right, one big serving of salad is one good dinner meal already... unlike during the winter. My husband loves making poached egg. Being a scientist that he is, he loves to do cook it as accurately as he did the last time haha. For sure we will have fun prepping this tonight. And oh we have jowl bacon so we are all set for dinner tonight. THanks for sharing the recipe and the other tidbits that go with it hihi. Hi Malou, sounds like your husband gets to make a big part of dinner tonight! This is a wonderful salad for this time of the year - enough food to be satisfying, but perfect for warmer weather. Thanks for the comment. Hi Alyssa, aren't dinner salads so fun? Plus you can add/subtract ingredients to suit your individual taste. Thanks for the comment. I should have known there was a name for this combination of ingredients other than a salad with egg, bacon, croutons and vinaigrette! I'm joking (mostly) because this is a very specific set of ingredients prepared in a very specific way, but I've been eating salad with (fried) egg, bacon, croutons and vinaigrettes for some time and never realized it was related to anything more than leftovers in my fridge ;) Love the use of frisee - one of my favorite greens. And this is such a perfect way to use of leftover bread on warm spring nights when nothing but a salad will do... Love it! Hi Mark, great combo of ingredients, isn't it? The fried egg version is quite nice, particularly if sunny side up. Thanks for the comment. I'm hungry and I need this salad now. Love the poached eggs deliciousness!! Wow John what a terrific salad! I am intrigued by the hot dressing. Okay now I'm hungry:) Thanks for sharing. Hi Kiran, this salad will certainly help satisfy your appetite! Aren't poached eggs wonderful? Thanks for the comment. Hi Hannah, the salad with the homemade mayo is worth waiting for - it's a main dish salad. Glad you enjoy the banter, and thanks for the comment. Hi Nancy, in cold weather the hot dressing is great! Also good when the weather warms up, but I then tend to prefer the cold version. Thanks for the comment. Hi Uru, it's really a great mix of flavors! Thanks for the comment. I love crispy lardons. What a great recipe and the dressing is so simple too. Another great recipe John. This is a salad sure to please a man. At least my man of a husband. Bacon and eggs and croutons. He may have to suffer through the endive but I believe he'll love it! Thanks Mr KR. It is freezing in Denver but salads give me hope! This is a salad I have been making for a while but didn't know it had a name. I always use the hot dressing - the bacon fat gives it such a delicious flavour. I always make the poached eggs at the last minute and, of course, it is a rush to get it all served with everything hot, especially if you want to take photos. Any dish I do with poached eggs, I now poach only one, photograph that dish and go back to do the others afterwards so only one person has a cold egg. Your idea of reheating them would solve those problems. Hi Liz, this is an all around simple dish (once one gets over the fear of egg poaching, that is). And so flavorful! Thanks for the comment. Hi Abbe, this is basically breakfast for dinner with greens thrown in! We've had warm weather the last few days, but getting down to 34 degrees F in a couple - not freezing, but the reason I'm waiting to plant tomatoes! Thanks for the comment. Hi Suzanne, poaching ahead and then reheating works really well, and means one less thing to do at the last minute. And I'm the same way when I photograph - I always try to prep a separate plate for photography, which happens before we eat. Thanks for the comment. Hi Charlie, those ending sections are fun to write! And it's about time we've gotten some warmer weather! Thanks for the comment. Love this salad but don't make it often enough because of the poached egg.... I can whip up a Swiss buttercream (on a humid day during a hurricane), make killer cheesecakes (thanks Ina!) or throw together a carne mechada but poached eggs? I hope my life never depends on it.... something so simple can be so frustrating! When I make mine, I just use the bacon fat in the pan (hot version) as my oil for the vinagrette and whisk it all together scraping up all the brown bits in the pan for added flavor. Think I'll make this over the weekend with your method for the poached eggs or maybe dropped eggs on toast (another favorite)....cant wait to see what other salads you have in store!!! Hi armymum12, poached eggs are pretty easy once you start doing them, although they're a lot easier if your eggs are very fresh (and really fresh eggs aren't usually that easy to get, I know). If my bacon is fatty enough and I'm making the hot version of this, I sometimes use just the bacon fat, too, although usually I need to add a bit of olive oil. Thanks for the comment. That's a gorgeous salad, and I can't wait to try it. Can't wait to check out all the upcoming salad recipes too! Hi Beth, it really is worth trying. I'm still figuring out which salads I'm going to include (so many to choose from) but a couple of them will be new to most people, I think. Thanks for the comment. That is one of my favorite salads! Extremely enjoyable and ever so flavordful. Your egg is perfectly cooked. What a gorgeous salad! Looks like a French bistro would serve a salad like this. Very refreshing dressing and your egg is (as always) PERFECTLY cooked! Hi Ashley, garlic is always good, isn't it? ;-) Thanks for the comment. Hi Rosa, isn't this a nice salad? One we always enjoy when we have it, and wonder why we don't eat it more often. Thanks for the comment. Hi Nami, it's a great salad, and really so good - I always enjoy making and eating it. Thanks for the comment. I've already noted down the ingredients you recommend for the dressing: it must be delicious. And I really have to say this: I love the photos, and especially how the egg looks in them! I love what an egg brings to a salad, John, and that's certainly true here. 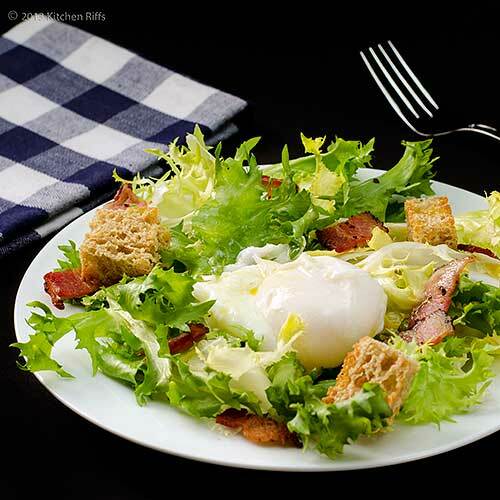 The yolk adds such richness to a dressing and really elevates the salad. And it really does make quite the presentation. Your excellent photos speak volumes. This is one salad I'll surely make. It will be sooner rather than later. Thanks, John, for the recipe and inspiration. Hi Alex, this really is a nice recipe - I think you'll be pleased with it. Thanks for the kind words, and comment. Hi John, I agree the rich egg yolk really adds a lot to this dish. I think you'll enjoy this salad - it's one of our favorites. Thanks for the kind words, and the comment. Hi John, this is an absolutely perfect dinner salad and your photos do look delicious! Hi Ilke,salads are sounds really appealing around now, aren't they? ;-) Thanks for the comment. Hi Judit + Corina, isn't this a nice salad? And I've been craving salad lately! Thanks for the kind words, and comment. Great post John! Your salad looks delicious and your post has inspired me and convinced me that this is definitely a salad that I need to make! Hot dressing, cold dressing - I want to try them both. Of course I'll have to wait for warm weather again. It was actually sleeting here this morning and the mountain got snow. So I made soup! :) In warm weather Bobby and I love "meal" salads like this. Can't wait to make it! Thanks for the recipe and the great notes! I love the combination of flavors. Perfect for dinner. Hi MJ, you definitely do need to make this! And both the hot and cold versions are quite nice. You'll enjoy! ;-) Thanks for the comment. Hi Dawn, aren't the flavors nice? As you say, really great for dinner. Thanks for the comment. Hi Maureen, although frisée is the classic green for this salad, it really does work with most. I do like it with the more bitter lettuces, though. Thanks for the comment. A great classic! My mom used to make a warm bacon dressing but only for garden lettuce in the summer. I don't know why she didn't make it for salads in the winter. Keep the salads coming! I just love this! You know I love bacon and eggs and greens together - this would be my perfect breakfast or brunch! Hi Lisa, if you haven't already, try warm bacon dressing with spinach - it's an awesome combo! Thanks for the comment. Hi Julia, this really is basically breakfast, isn't it? Although with some nice healthy green stuff! Thanks for the comment. That's a salad for the senses and it would certainly satisfy my appetite. I am not that much of a lard fan (depending where it comes from and who made it) but the idea of it with endives, a poached egg and a nice dijon style vinaigrette is just taking me back into my food dreams. I love vinaigrette and my indian husband does as well and without dijon mustard nothing works out in my house. ^.^ A great Salad John! Oh and btw I don't think so I have tried a hot vinaigrette before. I can't wait to try that out once when I get hand on some real proper lard. Hi Helene, hot vinaigrette is really tasty. I usually make the cold version of this salad, but when the weather is chilly, the hot version is quite nice. Thanks for the comment. I had this salad for dinner. As a main course. Was so delicious. Organic egg and real Dijon mustard - rich colour and texture. Hi La Torontoise, isn't this a tremendous salad? One of my favorites. It's a terrific main course. Thanks for the comment. What a beautiful (and tasty!) salad. I just love endive :) I will have to try this poached egg idea, it sounds wonderful, but I have never tried it with a salad like this before. Hi Kristi, add a poached egg to a salad like this is a lot of fun. The yolk really adds a new dimension (and one that's quite tasty!). Thanks for the comment. Hi Raymund, isn't this a nice salad? So tasty, too! Thanks for the comment. Hi BentoDays, it is yummy! ;-) Thanks for the comment. One of my favorite salads...I love simple bistro meals. Hi Karen, isn't bistro fare so nice? Although fancy dishes may impress, it's usually the simpler ones I find more flavorful. Thanks for the comment. Hi Terra, poached eggs in salad are so great! They really add a lot. Glad you're enjoying! And thanks for the comment. Hi Food Jaunts, isn't this such a nice salad? I tend to favor the cold version a bit more than the hot, but I agree they're both great, and both well worth having. Thanks for the comment. I need to make this for hubs, he would go nuts for this. Hi Kim, it's a super salad! I'll bet you'll go nuts over it, too. ;-) Thanks for the comment. I use a solid Tefal nonstick pan and can not understand why my eggs always stick lightly to the bottom of the pan. So, I use the spatula on regular basis, to detach the eggs. Hi La Torontoise, mine stick sometimes too (just a little), thus I often use a spatula too. I've thought about spraying the inside bottom of the pan with some cooking spray, or perhaps lightly greasing it - but I've been too lazy to do it! And the sticking hasn't bothered me that much, and the spatula always does the trick. Aren't poached eggs wonderful? Great flavor, and so simple! Thanks for the comment. Thank you, two times! The eggs are wonderful! Right now, it's the green asparagus season in my geographic zone, and poached eggs on steamed asparagus tastes very good too!! Hi La Torontoise, you're welcome! And you're right about poached eggs and asparagus being a wonderful combo. Spring food is so great, isn't it?